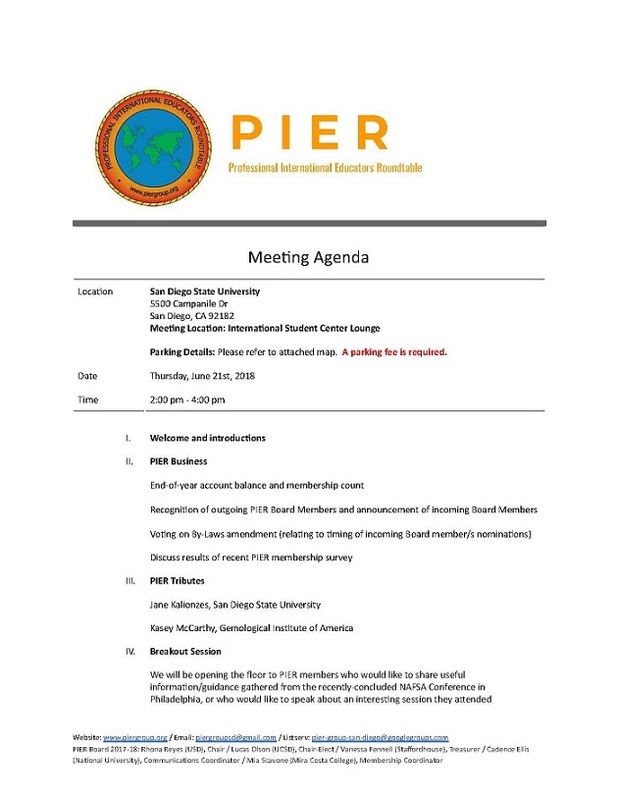 Please find agenda enclosed for PIER's last meeting of the school year, to be held this Thursday, June 21st, 2018, from 2-4 pm, at San Diego State University (SDSU). Please contact PIER for parking information. As a reminder, please give yourself some allowance to find your way around SDSU's campus, and locate the appropriate parking facility. A parking fee is required for this venue. At this meeting, we will also provide members with an opportunity to discuss interesting sessions or critical information gathered from the recently concluded NAFSA National Conference in Philadelphia. We encourage members who attended the conference ​​to come prepared with your notes and handouts, if applicable, to facilitate a more robust discussion with the rest of the group. We look forward to seeing you at SDSU.